Jerusalem Delivered & Illustrated Tasso, Torquato. Godfrey of Bulloigne, or, Jerusalem delivered ... translated by Edward Fairfax. London & New York: George Routledge & Co., 1858. 8vo (16.5 cm, 6.5"). Frontis., xlviii, 445,  pp. ; 7 plts.  � Fairfax’s English translation of the great Italian Renaissance epic, originally printed in 1600 and here edited by Robert Aris Willmott for the “Routledge’s British Poets” series. The volume is illustrated with a frontispiece and seven steel-engraved plates done from designs by Edward Henry Corbould, drawing and painting instructor to Queen Victoria’s children. The House of the Walderings Tautphoeus, Jemima Montgomery, Baroness. At odds. Philadelphia: J.B. Lippincott, 1897. 8vo (18.4 cm; 7.5"). 473, [6 (ads)] pp.  Baroness Tautphoeus (1807–93) was an Irish novelist whose stories focused on Bavarian life. This, her final novel, first appeared in 1863 with the first U.S. appearing in that same year. WorldCat locates only five institutional copies of this edition. Binding: Speckled grey cloth stamped in brown and blue with blue lettering; unsigned, but well designed. The LEC Goes to Camelot among Other Places Tennyson, Alfred Tennyson, Baron. The poems of Alfred, Lord Tennyson. Cambridge: Limited Editions Club, 1974. 8vo. 285,  pp. ; illus.  Selected and introduced by John D. Rosenberg for the British Poets series, here illustrated with 25 in-text, wood-engraved vignettes by Reynolds Stone. 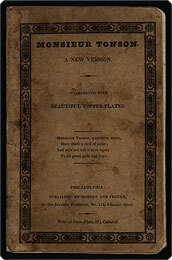 The volume was designed by John Dreyfus and printed at the Cambridge University Press in monotype Perpetua on English wove paper, and bound by Tapley-Rutter in quarter maroon goatskin with terra-cotta linen sides, the front cover bearing a black leather oval medallion embossed with a portrait of the author and the spine a gilt-stamped leather title-label. This is numbered copy 972 of 1500 printed, signed at the colophon by the illustrator; the appropriate LEC newsletter, in its (unstamped) envelope, is laid in. Much on “The Great Buzaglo” [Tickell, Richard]. The project. A poem. Dedicated to Dean Tucker. The fifth edition. London: Pr. for T. Becket, 1779. 4to. ff., 12 pp.  Unusual: ESTC gives listings for fourth and sixth editions, but not for a fifth edition. The "Buzaglo" referred to in the poem is the eponymous cast-iron stove designed by London inventor/ironmaster Abraham Buzaglo, which the author of the poem contends will, once installed, quell party strife in the House of Commons by warming the uncomfortable chill that provokes and riles the more partisan members. REPULSED by Shakespeare! Tolstoy, Leo; George Bernard Shaw; & Ernest H. Crosby. Tolstoy on Shakespeare. Christchurch, Hants: The Free Age Press; London: Everett & Co., [1907?]. 8vo (18.2 cm, 7.1"). Frontis., 120, viii (adv.) pp. Juvenile Adventures — Decorative Binding Trowbridge, John T. A pair of madcaps. Boston: Lothrop, Lee & Shepard Co., 1909. Sm. 8vo (19.5 cm, 7.625"). Frontis., –359,  pp. ; 7 plts.  Collection of one longish and a number of short works written for juveniles by Trowbridge, an American author who wrote for many different audiences, with illustrations by Frank T. Merrill. Included are his “A Pair of Madcaps,” “A Lost Reputation,” “The Corner of the Column,” “How the Hart Boys Saw Great Salt Lake,” and more. Binding: Periwinkle publisher's cloth, gilt lettering on spine and front cover; white, black, and red illustration on front cover of two teenagers addressing a crate for shipment. Turgenev in Love Turgenev, Ivan; Alec Waugh, intro. ; Lajos Szalay, illus. The torrents of spring. Westport, CT: The Limited Editions Club, 1976. Tall 8vo (24.8 cm, 9.75"). xiii, , 186,  pp. ; 8 col. plts., illus.  This Limited Editions Club edition of Turgenev's story of romantic love and regret— one of his few works without political nuance — is illustrated by Hungarian artist Lajos Szalay with eight full-page illustrations in beautiful, rich color, and ten line drawings within the text. British novelist Alec Waugh provides an introduction to the Russian novel translated by Constance Garnett. This is numbered copy 1063 out of 2000 printed, signed at the colophon by the illustrator. The monthly newsletter is laid in. Binding: Publisher's quarter green calf with marbled paper–covered sides and gilt lettering to spine, done by the Tapley-Rutter Company. Twain, PYLE, & La Pucelle Twain, Mark, & Howard Pyle, illus. Saint Joan of Arc. New York & London: Harper & Brothers, 1919. 8vo (24 cm, 9.45"). xiii, , 32 pp. ; 4 col. plts. This is the first edition, first issue, with the copyright page marked May, 1919, “D-T,” and the endpapers printed in green. A Family & Friends Production — Signed by Richard Ellis Upham, Francis Bourne. Fenestrae: Windows through which a friend may see the soul of a busy man. New York: Privately printed, 1939. Small 4to (25.3 cm, 10"). , 94,  pp.  A limited-edition collection of poetry privately printed by Richard Ellis, a friend of the poet's son, at the Haddon Craftsmen Press. Francis Bourne Upham, Jr., writes in his introduction that his father's poetry was here reprinted in only 40 copies for a small number of family members and close friends, this second edition (the first appeared in 1930) newly including intimate explanatory notes at the end of each poem. The volume is signed by Richard Ellis at the colophon. WorldCat has located one institutional copy in the U.S. (Temple). A Family & Friends Affair — Morocco Bound Upham, Francis Bourne. Fenestrae: Windows through which a friend may see the soul of a busy man. New York: Privately printed, 1939. Small 4to (25.6 cm, 10"). , 94,  pp.  The above (perhaps) oddly without Ellis's signature, specially bound . . .